Affordable College helps help people saving money by attending community colleges transfer to 4-year universities without losing credits. We helped them articulate the brand and build their responsive website. See It Here. We remember college. It was expensive. And for most of us, a little while ago. We understand that the price tag has gone nowhere but up since, so when startup and B-Corp Affordable College approached us to help with their brand and website, we were excited to get the chance to make a difference. AC uses a unique angle to help people saving money by attending community colleges transfer to 4-year universities without losing credits, time or cash. A+ work for sure. Helping Make College a Cost Students Can Bear. More than 10 million students enroll at community colleges every year—that’s 50% of all undergraduates. However, when they go to transfer to a 4-year university to finish their degrees, they lose on average 13 credits, falling a semester behind and racking up excess student loan debt. This causes a lot of people to just quit. But many small-to-medium universities need these students to fill out their classrooms. It’s an unfortunate situation. Affordable College steps into the mix to connect students to their future alma-maters, and universities to community colleague partners to ensure transfers are smooth and lossless. 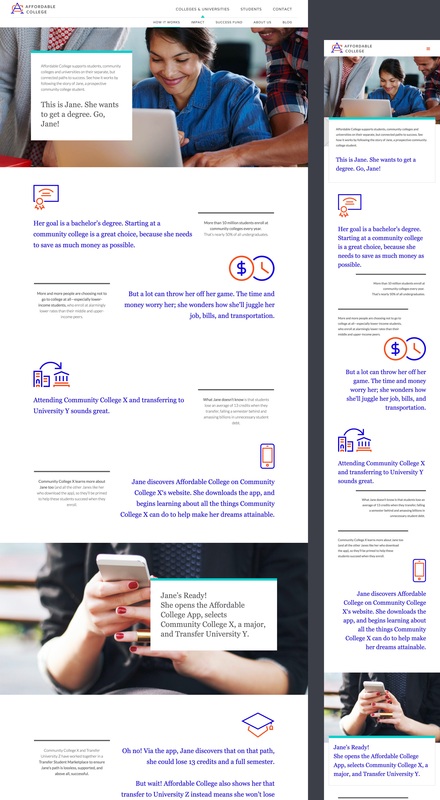 Affordable College's story is not an easy one to tell, so we mapped it out using “Jane”, a typical community college prospect. Visit the site, and you can walk through the experience with her—and get a first-person understanding of what Affordable College really does for students and schools. The responsive site streamlines the narrative, giving donors and partners the meat they want, but also highlighting the emotional story of students in need and their struggles. A little bit of branding and a little bit of business consulting. 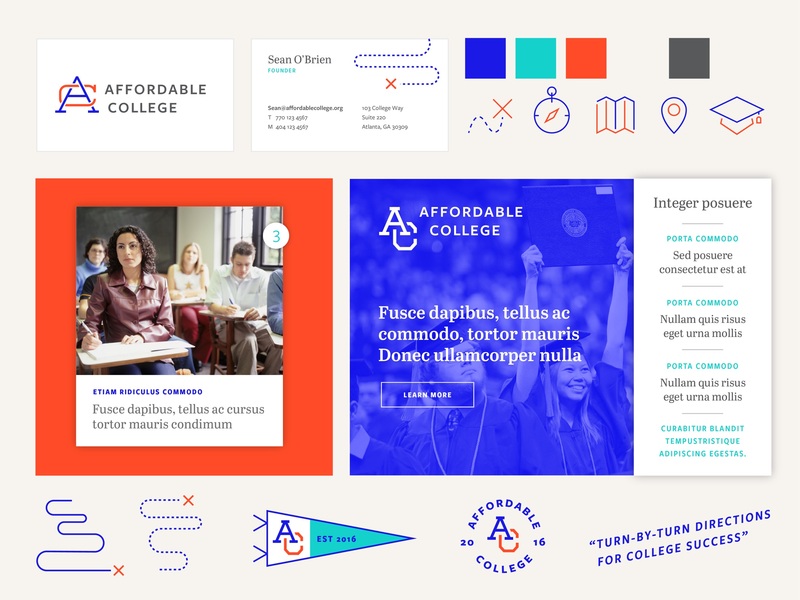 Affordable College took advantage of our Brand Sprint and Responsive Design capabilities to turn its founder’s idea into a saleable reality. Our brief process helped AC refine its offering to colleges and discover new angles from which to tell its story. 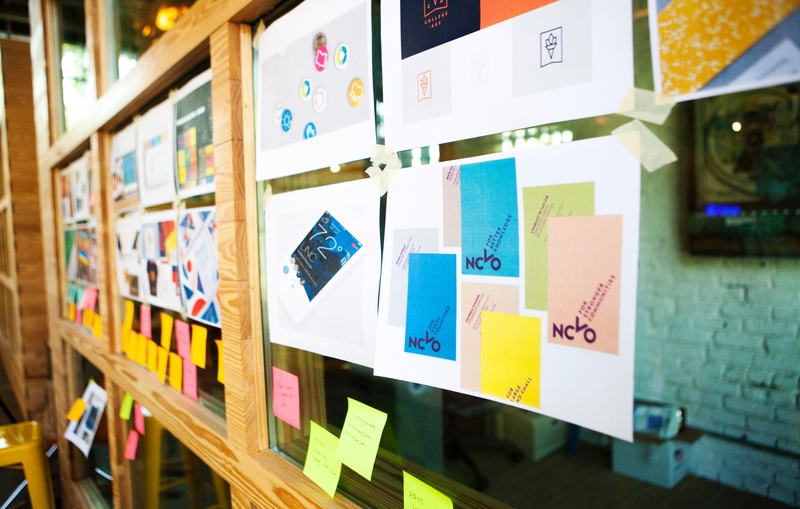 We created simple messaging for direct mail, helped AC’s founders with pitches, and guided them through expressing their impact in a number of ways. We looked to traditional collegiate colors and ivy-league emblems, but quickly realized that Affordable College has a sportier, more active personality. They’re an updated reflection of the institution of higher learning (more puffer jacket and jeans than khakis and wool blazer), so we designed a logo that would look just as awesome on a ball cap as it would on a polo shirt. We also chose clean, personable fonts and filled the site with poppy, screened-back color and snapshot-like photography. Business cards rounded out the suite of materials, and these were a little different, too. 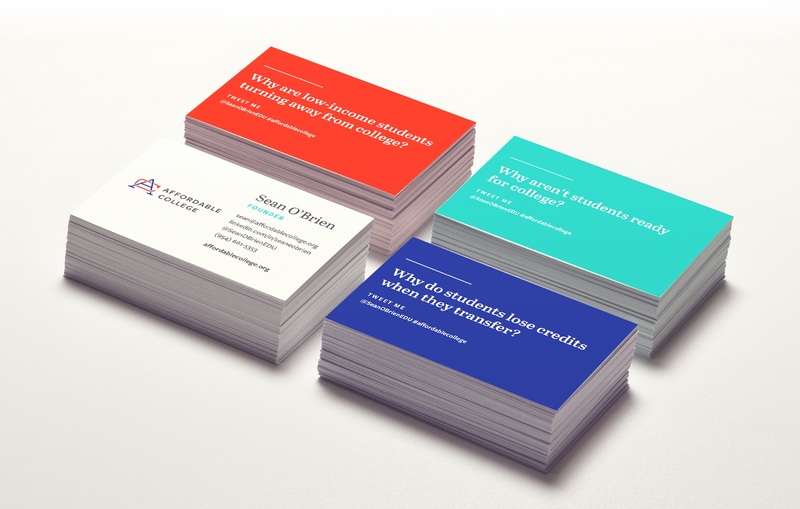 In the set, we printed 4 separate designs, each with an education-related, conversation-starting question on the back. AC’s founders use them to approach potential partners at trade shows and get the ball rolling.